When the U.S. Government Accountability Office released a report saying that worldwide GPS performance is likely to degrade in the next few years, lot of people, public and private, kinda flipped. Cue the inevitable about-face, right about...now. The Air Force recently held a Twitter news conference to a—wait, what? Force Space Command's subject-matter-expert on the Global Positioning System (GPS) program will Twitter on the command's site, www.twitter.com/AFSpace, in response to the recent Government Accountability Office report on the GPS program. Apparently, the F-22 Raptor was only phased out to free up some funds to buy everyone Twitterific licenses. Anyway. The issue is under control. We are working hard to get out the word. The issue is not whether GPS will stop working. There's only a small risk we will not continue to exceed our performance standard. 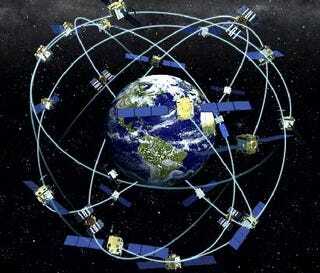 Agree w/ GAO thr's a potential risk, but GPS isn't falling out of the sky—we have plans 2 mitigate risk & prevent a gap. We have 30+ satellites on orbit now. We'll launch another in Aug 09, and again early 10. Going below 24 won't happen. Dropping below 24 satellites was the central concern of the initial report, and the subject of all its various probability calculations: when reporters talk about the 90% chance of GPS degradation by 2017, they were actually referring to the chances of the satellite constellation dipping below 24.